Means of Entertainment. 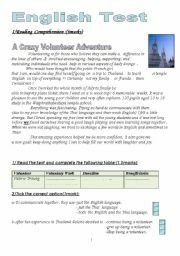 (Mid Term Test 3 9th form) 2 Parts: Listening+Language+Key+Link. 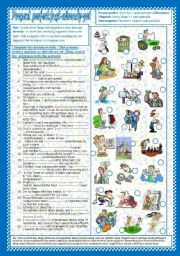 Complete the sentences by using the bracketed words in the present perfect. 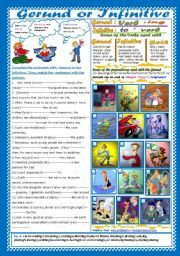 Then, match the sentences with the pictures. 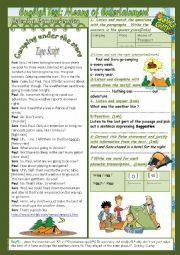 Pupils have to read the rules and complete the sentences with must-mustn�t-don�t- have to-don�t have to. Then, match each picture with a sentence. 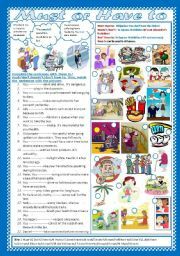 Pupils have first to choose the corre ct from the list, then match each sentence with a picture. In task two, they have to complete with the correct expression from the list. Happy Birthday(End of Term 2 Test 7th form):2parts: Reading Comprehension+Language+Key. 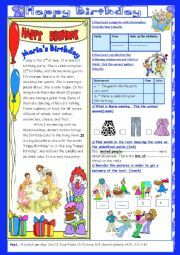 A reading passage about a birthday party with some related questions/ Language: 4tasks: The first is related to birthday/ The second is match parts of sentences together at a restaurant / The third is to circle the right answers and it is related to market day/The fourth is related to choosing a birthday present. 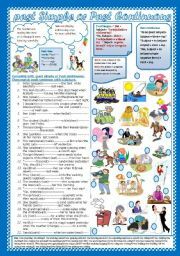 Read the rules and put the bracketed verbs in the correct tense. Then match each sentence with a picture. 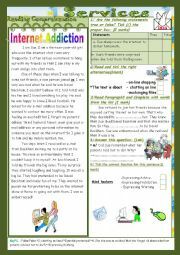 Internet and other services(End Term2 Test 9th form)3parts: Reading Comprehension+Language+Writing+Key.